What Horse Grooming Supplies do You Need? If you are looking for horse grooming supplies, and walk into a tack shop or horse supply store you will quickly find yourself immersed in row upon row of horse care products and tools. But what do you really need? Probably less than you might think! Here our quarter horse filly Josie is enjoying getting a light brushing with a soft rubber curry comb. She is choosing to stay with her friend for a brush and a scratch even though she is at liberty in a corral with other horses. 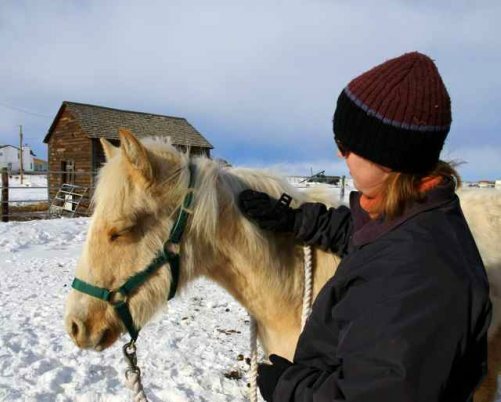 This was one of the first times she was groomed after being brought from an auction to the horse rescue. The bonding experience, and learning to trust and want to be around people were far more important than what brush was used, and how she looked when she was done! When it comes to horse care and grooming, the most important tools you can ever have, are your fingers and hands. Your bare hands allow you to feel bumps and scratches that may need looking after, as well as heat and swelling that might be present. 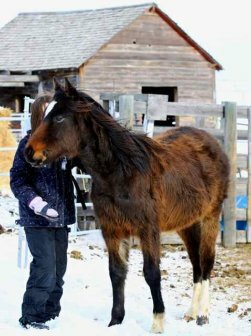 Your horses thick hair makes it difficult to see things with just your eyes, so giving your horse a quick full body rub each time you visit is a great habit to get into. It’s also a great way to reconnect physically and emotionally with your horse. After all, horses do so much of their communicating through touch and feel as they groom each other...so why shouldn't we do the same! To make horse grooming simpler it really helps to have a horse grooming kit. You can purchase ready made horse grooming kits from your local discount horse supply store, or from an online retailer. 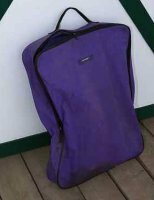 Or you can put together you own ~ simply fill a horse grooming tote with your favorite horse grooming supplies. You will need face and body brushes, curry combs, hoof picks, horse fly spray, mane and tail de-tangler and any other horse care supplies you use on a regular basis! I love this hanging horse grooming kit, because it zips up and keeps all of our horse grooming supplies in one place. We board our horses, so this helps eliminate some of the confusion in the tack room, and keeps smaller items from getting lost or borrowed! Click here to take a peak inside one of our horse grooming kits! How you groom your horse will depend on what activities you are doing. If you are like me and spend most of your time with your horse sticking close to the pasture, grooming will be very simple. For my horses and me it's more about spending time together than looking fabulous! If you are planning on showing or competing however, there will be lots of additional bathing, clipping and mane and tail braiding involved! You'll probably need some specialty horse grooming supplies and products. I don't usually have any particular plan in place for grooming my horses. We spend the majority of our time working at liberty, with little or no tack, so there I don't worry about dirt rubbing and debris rubbing between blankets, saddles and bridles. brush off mud, and crusty debris, and scratch any really itchy spots ~ your horse will thank you! Selene soaking up the love...and the sun! So how do you know what your horse wants? I always give my horses the choice to be groomed or not. I don't tie them up when I groom them, I'll either hang the rope around their neck, or skip the halter altogether. I also pay close attention to how they react to certain brushes. If they always walk away when they see a particular horse brush, I assume that it doesn't feel good. On the other hand, if they stretch, go to sleep or give me other signs they are really enjoying a session I assume they like that brush. Often if you hold out two or three brushes for your horse to choose from, they will grab the one they want! Give it a try with your horse, and see if they can help you pick which horse grooming supplies make up your grooming kit!